Draft: 2009, Pittsburgh Pirates, 1st rd. Jorge Anthony Sanchez...Is a 2006 graduate of Killian High School in Miami, Florida, where he graduated with a 4.0 grade point average and was a three-time All-Dade County selection...Served as the team captain in 2005 and 2006 and led the team in every offensive category as a senior...Played three years at Boston College and finished collegiate career ranked fifth in school history in home runs (24) and RBI (124), sixth in hits (202) and eighth in runs scored (125)...Batted .317 in 161 career games at BC...Led the Eagles in batting average (.346), slugging percentage (.614), on-base percentage (.443), home runs (tied with 14) and runs scored (63) during final year as a junior in 2009...Also established a single-season school record with 63 runs scored...Was one of three finalists for the 2009 Coleman Company-Johnny Bench Award, which is presented annually to the nation's top collegiate catcher...Was also tabbed as one of 30 semifinalists for the Golden Spikes Award, presented annually to the nation's premier amateur baseball player...Played in the Cape Cod League in 2008 for the Yarmouth-Dennis Red Sox and led the team with a .326 batting average in 34 games...Was also named as the starting catcher in the Cape Cod Baseball League All-Star Game and was a member of the All-League team...Signed by Pirates scout Chris Kline...Participated in the Pirates team caravan and PirateFest event this past December. Was the lone rookie position player to make Pittsburgh's Opening Day roster...Made season debut on 4/2 vs. Chicago (NL) and delivered game-winning single as a pinch hitter in the 16th inning...Had two RBI while making his first start on 4/3 vs. Chicago...Made second start on 4/6 vs. St. Louis and broke 1-1 tie with a game-winning single off Adam Wainwright in the seventh inning...Hit safely in each of his first six games thru 4/16...Was optioned to Triple-A Indianapolis on 4/19 when Chris Stewart was reinstated from D.L....Homered in his fourth game with the Indians on 4/24 at Toledo...Went 4-for-16 with a homer and five RBI in five Triple-A games from 4/20-25...Was recalled by Pittsburgh on 4/26 after Russell Martin went on the D.L...Had a two-run single on 4/26 at St. Louis...Extended his hitting streak to eight games with a single on 4/27...Raised average to .303 with a two-hit game on 5/2 vs. Toronto...Hit safely in five straight games from 5/10-18...Connected off Yovani Gallardo for first home run on 5/15 at Milwaukee...Homered again two days later at Yankee Stadium off Hiroki Kuroda (game one)...Made 15 starts while Russell Martin was on the D.L. between 4/26 and 5/22 (Pirates went 8-7)...Was optioned back to Triple-A when Martin came off D.L. on 5/23...Went 2-for-4 with two doubles and two RBI in second game back with Indy on 5/27 vs. Buffalo...Tallied 12 RBI in nine Triple-A games between 5/26 and 6/4...Homered twice and had five RBI on 6/4 at Syracuse...Went 4-for-4 with three doubles on 7/11 vs. Columbus...Produced a .519 slugging percentage and a .923 OPS in 26 games during the month of July; 14 of his 21 hits in July were extra-base hits (11 doubles and three homers)...Batted .313 (20-for-64) and recorded five three-hit contests in his last 17 games with Indy...Made a total of 70 appearances behind the plate with Indianapolis and two at first base (8/22 and 8/27)...Was recalled on 9/1 and was used exclusively as a pinch hitter in five September games...Recorded a sacrifice fly as a pinch hitter in 11th inning on 9/5 at Wrigley Field...Made a total of 20 appearances (19 starts) behind the plate with the Pirates...Played 10 games with Toros del Este in the Dominican Winter League. Spent majority of season with Triple-A Indianapolis, where he was named MVP of the mid-season All-Star Game after hitting a three-run homer in the 4-2 victory...Was also named to the league's post-season All-Star team...Made 72 appearances behind the plate with Indy and threw out 22 of the 93 baserunners (24%) attempting to steal against him...Also committed 14 errors and had seven passed balls...Hit .311 (28-for-90) against LHP and .259 (64-for-247) against RHP...Established minor league career highs in doubles (27) and home runs (10)...Began season with Indianapolis and hit a two-run walkoff homer with two outs in the ninth inning in a 5-4 win over Louisville on 4/22...Joined the Pirates in New York on 5/11 as a part of the "Taxi Squad," but did not appear in a game before being returned to Indy the following day...Homered three times in a five-game span from 5/28 to 6/2...Had four hits on 5/31 at Columbus...Produced a .369 (24-for-65) average and 16 RBI in 20 games during the month of May...Hit safely in nine straight games from 6/10-20 (11-for-31, .355)...Was recalled by Pittsburgh on 6/21...Made his Major League debut as the designated hitter on 6/23 at Los Angeles (AL); went 1-for-3 with a double off Joe Blanton in his first at bat...Served as the DH again on 6/25 at Seattle and went 1-for-5 with a run scored...Was optioned back to Indianapolis on 6/27 and hit .247 (19-for-77) in his next 21 Triple-A games thru 7/27...Was recalled by Pittsburgh on 7/28...Made his first big league start behind the plate in game two of a doubleheader on 7/30 vs. St. Louis and tallied his his first Major League RBI...Had career-high two hits and connected off Tim Lincecum for first Major League home run on 8/24 at San Francisco...Was optioned to Double-A Altoona on 8/28 and played in four games before being recalled again on 9/3...Hit second big league home run on 9/15; a solo shot off Chicago's Travis Wood at PNC Park...Had second career two-hit game with the Pirates on 9/19 vs. San Diego; also made incredible catch while falling into visitor's dugout in the eighth inning...Made a total of 16 appearances (12 starts) behind the plate with Pittsburgh; did not throw out any of the five runners attempting to steal against him and had two passed balls...Went 13-for-52 (.250) with two homers in his 14 starts with the Pirates (12 as catcher/2 as the designated hitter). Hit .251 (87-for-347) with 26 doubles, eight home runs and 43 RBI in 102 minor league games between Double-A Altoona and Triple-A Indianapolis...Established minor league career high in doubles...Began season with Altoona, where he made 37 appearances behind the plate and threw out 13 of the 49 (27%) runners attempting to steal against him...Tallied lone triple (third career) in first game on 4/5 vs. Erie...Reached base safely in 19 of his 21 starts during the month of May and batted .289 (22-for-76)...Was promoted to Indianapolis on 6/4 and made Triple-A debut on 6/5 at Pawtucket...Hit safely in each of his first seven games with Indy...His Triple-A batting average dipped to .180 following the action on 6/30; hit .255 (37-for-145) in his final 44 games...Homered in three straight games from 7/2-5 and hit six of his eight home runs during the month of July...Hit safely in seven straight games from 7/1-12 (10-for-29, .345)...Produced a .271 batting average in August, hitting safely in 13 of his 21 games...Made 59 appearances behind the plate with Indianapolis and threw out 18 of the 58 (31%) runners attempting to steal against him...Also had four errors and seven passed balls among his 500 total chances...Started Game 1 of the International League playoff series against Charlotte and went hitless in two at bats. Spent entire season with Double-A Altoona and singled in first at bat on 4/7 at Erie...Made 104 appearances behind the plate and went 7-for-37 (.189) with a homer in 11 games as the designated hitter...Homered in third game on 4/10 at Erie...Tallied second professional triple on 5/14 vs. Erie...Had first pro sac bunt on 5/24 vs. Bowie...Produced his highest monthly average in May, hitting .280 (21-for-75) with 10 RBI...Hit .205 (16-for-78) in June and .213 (19-for-89) in July before rebounding to produce a .274 (23-for-84) average in August...Knocked in season-high four runs on 8/16 vs. Erie...Hit fifth and final home run on 8/23 vs. Richmond. Season was limited to just 59 games due to injury...Was named to Florida State League mid-season All-Star team and selected to play in MLB Futures Game, but did not particpate...Spent entire season with Bradenton, where he made 40appearances at catcher and went 20-for-60 (.333) in 17 games as the designated hitter...Batted .348 (23-for-66) with three homersand 18 RBI in 19 games during the month of April...Homered in back-to-back games on 4/16-17...Went 13-for-23 (.565) in a sixgamespan from 5/25-30, raising average from .290 to .327...Tallied his stolen bases on 6/16 at St. Lucie and 6/21 vs. St.Lucie...Homered for last time and was hit twice by pitches on 6/21...Suffered a broken jaw after taking a pitch to the face on 6/22vs. St. Lucie and missed remainder of the season...Had surgery to repair two small fractures to the left side of his jaw on6/24...Returned to action in the Arizona Fall League, where he hit .206 (14-for-68) with four homers and nine RBI in 18 games withMesa...Homered twice and knocked in four runs on 11/11 at Surprise...Hit .316 against lefthanders and .163 againstrighthanders...Was selected to play in the Arizona Fall Leagues Rising Stars Game. Hit a combined .309 (55-for-178) while playing at three different levels in first professional season after being selected fourth overall by Pittsburgh in the First-Year Player Draft...Made professional debut with Single-A State College just eight days after signing on 6/12...Singled and knocked in a run in his professional debut on 6/20 at Williamsport...Hit safely inthree of his four games with State College before being promoted to Single-A West Virginia on 6/25...Went 15-for-34 (.441) whilehitting safely in eight of his first nine games with the Power...Hit first professional home run while also knocking in five runs on7/10 vs. Delmarva...Ranked sixth among South Atlantic League batters with a .348 average (24-for-69) during the month ofJuly...Knocked in a run in eight straight games (16 RBI total) from 8/9-20...Recorded lone stolen base on 8/9 at Hickory...Took homeSouth Atlantic League Batter-of-the-Week honors for the week of 8/10-16 after going 4-for-16 with two home runs and 10 RBI infour games...Recorded lone triple on 8/28 at Bowling Green...Knocked in at least one run in 14 of his last 17 games with thePower...Was promoted to High-A Lynchburg for final three games of the regular season and the playoffs...Doubled and knocked in arun in debut with Hillcats on 9/5 at Salem....Doubled, homered and knocked in three runs in eight games for the Carolina LeagueChampion Hillcats in the postseason...Hit a combined .467 (14-for-30) against lefthanders for the season...Was ranked by BaseballAmerica as Pittsburgh's third-best prospect following the season. 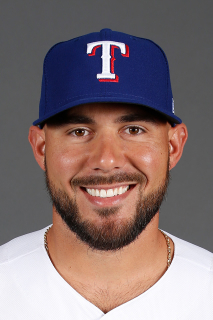 January 22, 2019 Texas Rangers signed free agent C Tony Sanchez to a minor league contract and invited him to spring training. January 22, 2019 C Tony Sanchez assigned to Nashville Sounds. November 2, 2018 C Tony Sanchez elected free agency. May 13, 2018 Tony Sanchez roster status changed by Round Rock Express. May 5, 2018 Round Rock Express placed C Tony Sanchez on the 7-day disabled list. April 19, 2018 C Tony Sanchez assigned to Round Rock Express. April 16, 2018 Cincinnati Reds traded C Tony Sanchez to Texas Rangers for cash. April 4, 2018 C Tony Sanchez assigned to Louisville Bats. February 25, 2018 Cincinnati Reds signed free agent C Tony Sanchez to a minor league contract. October 23, 2017 C Tony Sanchez elected free agency. October 23, 2017 Atlanta Braves sent C Tony Sanchez outright to Gwinnett Braves. September 24, 2017 Atlanta Braves selected the contract of C Tony Sanchez from Gwinnett Braves. September 12, 2017 Atlanta Braves sent C Tony Sanchez outright to Gwinnett Braves. September 1, 2017 Atlanta Braves activated C Tony Sanchez. August 31, 2017 Atlanta Braves traded 2B Brandon Phillips and cash to Los Angeles Angels for Tony Sanchez. August 31, 2017 Atlanta Braves reassigned C Tony Sanchez to the minor leagues. May 25, 2017 Salt Lake Bees activated C Tony Sanchez from the temporarily inactive list. May 23, 2017 Salt Lake Bees placed C Tony Sanchez on the temporarily inactive list. December 15, 2016 C Tony Sanchez assigned to Salt Lake Bees. December 1, 2016 Los Angeles Angels signed free agent C Tony Sanchez to a minor league contract and invited him to spring training. November 7, 2016 C Tony Sanchez elected free agency. November 2, 2016 San Francisco Giants sent C Tony Sanchez outright to Sacramento River Cats. October 12, 2016 San Francisco Giants activated C Tony Sanchez. October 5, 2016 San Francisco Giants reassigned C Tony Sanchez to the minor leagues. September 27, 2016 San Francisco Giants selected the contract of C Tony Sanchez from Sacramento River Cats. August 3, 2016 C Tony Sanchez assigned to Sacramento River Cats. August 2, 2016 San Francisco Giants signed free agent C Tony Sanchez to a minor league contract. July 28, 2016 Buffalo Bisons released C Tony Sanchez. February 19, 2016 Toronto Blue Jays signed free agent C Tony Sanchez to a minor league contract and invited him to spring training. February 19, 2016 C Tony Sanchez assigned to Buffalo Bisons. January 13, 2016 Pittsburgh Pirates released C Tony Sanchez. January 6, 2016 Pittsburgh Pirates designated C Tony Sanchez for assignment. October 8, 2015 Pittsburgh Pirates activated C Tony Sanchez. October 5, 2015 Pittsburgh Pirates recalled C Tony Sanchez from Indianapolis Indians. April 17, 2015 Pittsburgh Pirates optioned C Tony Sanchez to Indianapolis Indians. November 12, 2014 C Tony Sanchez assigned to Toros del Este. September 1, 2014 Pittsburgh Pirates recalled Tony Sanchez from Indianapolis Indians. May 23, 2014 Pittsburgh Pirates optioned C Tony Sanchez to Indianapolis Indians. April 26, 2014 Pittsburgh Pirates recalled Tony Sanchez from Indianapolis Indians. April 19, 2014 Pittsburgh Pirates optioned C Tony Sanchez to Indianapolis Indians. October 12, 2013 Pittsburgh Pirates activated C Tony Sanchez. October 3, 2013 Pittsburgh Pirates reassigned C Tony Sanchez to the minor leagues. September 3, 2013 Pittsburgh Pirates recalled C Tony Sanchez from Altoona Curve. August 28, 2013 Pittsburgh Pirates optioned Tony Sanchez to Altoona Curve. July 28, 2013 Pittsburgh Pirates recalled Tony Sanchez from Indianapolis Indians. June 28, 2013 Pittsburgh Pirates optioned Tony Sanchez to Indianapolis Indians. June 21, 2013 Pittsburgh Pirates recalled Tony Sanchez from Indianapolis Indians. March 15, 2013 Pittsburgh Pirates optioned Tony Sanchez to Indianapolis Indians. November 20, 2012 Pittsburgh Pirates selected the contract of Tony Sanchez from Indianapolis Indians. September 13, 2012 Tony Sanchez roster status changed by Indianapolis Indians. September 6, 2012 Indianapolis Indians placed C Tony Sanchez on the 7-day disabled list. June 4, 2012 C Tony Sanchez assigned to Indianapolis Indians from Altoona Curve. January 19, 2012 Pittsburgh Pirates invited non-roster C Tony Sanchez to spring training. January 18, 2011 Pittsburgh Pirates invited non-roster C Tony Sanchez to spring training. September 19, 2010 Tony Sanchez assigned to Altoona Curve from Bradenton Marauders. August 31, 2010 Tony Sanchez assigned to Mesa Solar Sox. July 2, 2010 Tony Sanchez roster status changed by Bradenton Marauders. January 4, 2010 Pittsburgh Pirates invited non-roster C Tony Sanchez to spring training. September 5, 2009 C Tony Sanchez assigned to Lynchburg Hillcats from West Virginia Power. June 25, 2009 Tony Sanchez assigned to West Virginia Power from State College Spikes. June 20, 2009 Tony Sanchez assigned to State College Spikes from Pittsburgh Pirates. June 12, 2009 Pittsburgh Pirates signed C Tony Sanchez.